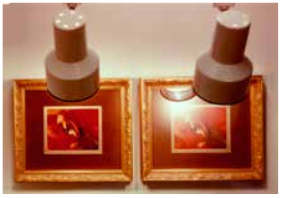 ACRYLITE® (P-99) non-glare sheet is designed to minimize glare and reflection and maximize the unhindered viewing of framed artwork and prints. This special matte finish shows off the art from almost any angle under typical lighting conditions. A superior product, ACRYLITE® (P-99) non-glare acrylic is lightweight, easily fabricated and can be painted or silk-screened for a variety of applications. ACRYLITE® UV filtering non-glare (OP-3 P-99) sheet offers UV protection with a matte finish for glare-free viewing and enduring enjoyment. Standard stock item is .118 x 48″ x 96″. We will custom cut pieces to your dimensions. Thicker and/or larger sheets may be special ordered. Minimums may apply.